I like the window up high like that. It gives you a place to put things in the room. I am always stunned at just HOW many cans of worms a house can be hiding. You never really know until you have sold it! I hope you and Dan can have a respite from, "Now what?" Ahh projects and how they grow! Nice repair work and it sure looks better. Good luck with the rest of the job. How are the piglets? My husband and I now double or budget for home projects like that. It's almost lost ke Murphy's law. I love the new window. The piglets are starting to follow Polly around, even though they are still so little! They also recognize her when she approaches them and start to squeal for their meal! So cute. 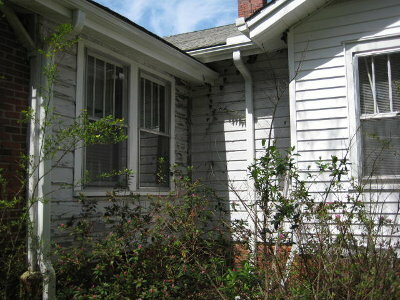 Uggghhhh, I am dreading finding out what is hiding under our siding. It's nice to know things are cleaned up and stable though. You and your husband were really born out of your time. You would have made excellent pioneers. Dan says the hardest part is resisting the urge to re-do the whole thing from the foundation up. The house has stood over 90 years as it is, so if we can at least repair the damage and strengthen as needed, we're certainly helping. You must already have half a plan in mind for the layout of your studio to know that the higher placed window was an excellent idea. When we did my quilt room, hubby wanted to put a big window on the south wall so I could look out on the gardens, but I knew I needed to give up "the view" for my big cutting table and storage space. I've never regretted doing that. When we bought our place we did tear everything down to the studs. Even then we ran into more "problems" than you would have thought could exist! The way you and Dan are doing it is the opposite way to go, but with your talents and patience (! ), you're going to have a gorgeous home you'll know is sound and secure. Aren't those surprises just dandy??? Glad you and Dan were able to find a work around. Love those little piggies. They're adorable. I've gotten myself into a few of those projects. I always seem to go into various phases. First the panic and despair, followed by determination and internet research (love This Old House videos for this) and finally the get it done and love the experience I now have for having done it myself phase. Looks great! I wonder if we had replaced our windows one at a time instead of all at once if we could have gotten around some of the silly building codes. Ah well, no use crying over spilled milk now. I absolutely hate when you tear apart something, and find you have to fix everything before going back to fix the original problem. The problem makes for a full time job to repair. We've been in this boat when my parents inherited my grandmothers home many years ago. Dan has fixed the problem nicely, good luck, and great work!!! The tank wont cover the windows will it? Good work Dan. My hubby loves this show above all others as they reuse and recycle. They also use traditional building skills instead of "rip it out and replace" with new. Goodness! Do you ever feel like your life is an episode of Punk'd? You certainly are rolling with it very well! There's nothing like starting a small job, you turn around and suddenly the whole house needs rebuilding and you need to take on a second mortgage. Seriously though, I like the thrifty nature of your repair, no wastage, fits in with your lifestyle. When I lived at my parents they used to have sky and I used to love this old house and new Yankee workshop! Great pictures of the work you've done. When I decided to be a carpenter I knew it would eventually help with the life I wanted to live. Looks like your carpentry skills are pretty essential as well! Kev, seems that agrarian lifestyle types need a lot of skills, especially problem solving. The roofers we hired did a very poor job on the roof where that room attaches and we've found where the roof leaked since then plus all kinds of damage that should have been dealt with prior to putting on a new roof. What a challenge! Great repair job, Leigh. Isn't it wonderful to have a husband that can do all of these things? We are spoiled that way, you know? I am very interested in your water tank, how you hook it up and how you utilize it. I've seen the others you have installed, so I'm wondering if this will be the same type and format. Wise move considering how things are developing in the world. Water is a necessity we can't do without, and it may not always arrive on demand via the faucet. I look forward to part 2. Finding the problems and fixing them, have prolonged the life of your house. Though I know what you mean about one tiny job, leading to many more significant ones which develop. I love that feeling once a job is done and dusted though. You'll look back at this post one day and go, "oh yeah, the windows", as if it was yesterday's news, lol. Ed, that's it exactly! Even so, we almost dread tearing into anything, even though we look forward to making a change. I suppose it just comes with the territory. That's a good question. We are fortunate that we are outside of city limits, and that the county codes aren't as restrictive as the city's. Sounds like your back porches are going to be a huge job! Sandy, it seems like there's no way around it! Sadly, even newer houses have problems. LOL. It's one of the joys of being a home owner. Lynda, no, the tank is relatively tall, but it won't block the view. At least not this one, and I'll be glad to have the wall space for my desk. Thanks Fern! Water has been at the top of Dan's list for things needing to be addressed. We can't do much about electricity at this point, but water is thankfully doable. Chris, keeping that in mind (about the longevity of the house) really helps, although we're amazed it's stood this long. The new windows, especially, have made a noticeable difference in energy efficiency and the house's comfort level in both hot and cold weather. That's the biggest plus. So true, Nancy, so true! We've had a chimney leak for a couple years...I'm terrified to open up that wall...I know it's going to be a major expense and a disaster!! BUT, it just has to be done...thanks for the post...today I'll start clearing out the room between the fireplace and the family room...that wall's getting fixed before winter!